Now and Later Watermelon are bite-size pieces of taffy that last a long time... some for now and some for later. Now and Later Watermelon Candy pack has 6 individually wrapped pieces of taffy each 0.93 oz. 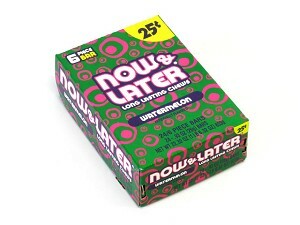 Now and Later flavors are Apple, Banana, Cherry, Grape, Strawberry, Watermelon, Tropical Punch, Tropical Lemonade, Cherry/Apple Splits, Pineapple, Wildberry & Blue Raspberry.